The Place is Buzzing… Bee Here! 16 Jul The Place is Buzzing… Bee Here! 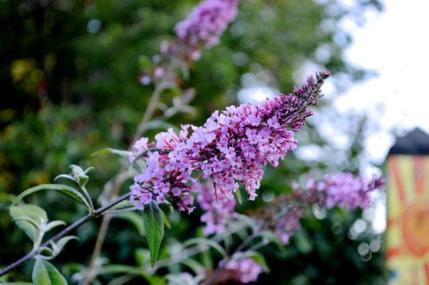 Butterfly bushes are not a larval food plant but they sure are a GREAT nectar plant for butterflies of all types and sizes. I have them all around my deck where I sit every evening. Butterfly bushes are not a larval food plant but they sure are a GREAT nectar plant for butterflies of all types and sizes. I have them all around my deck where I sit every evening. This week I feel like summer is at its peak. I walk out of my house and literally shake my head in wonder at the overflowing bounty of food and colorful flowers that surround me. On Sunday evening, my husband and I were sitting on the deck and he kept commenting on the LIFE in the garden. Bees, hummingbird moths, hummingbirds (yes, our chairs are surrounded by containers filled with their favorite flowers), and bird families flitting everywhere practicing their songs. Paradise. All of my Persicarias are starting to flower this week. I have three colors but I don’t have ‘Orangefield’- I will soon! 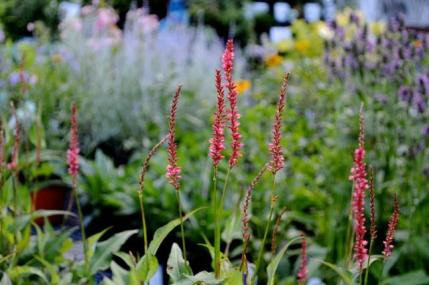 Where else can you find a perennial that flowers from July through October. I LOVE this plant. There is so much food to pick all at once- raspberries are falling off the plants, blueberries too. Every day a new zucchini doubles in size. Cucumbers forming constantly. I cut windows as one perennial crowds out another, I stake and primp but feel like, this year, things are just GIGANTIC! Who could ever have imagined, back in March as we came off of such a snowy, bitter winter, that we could be experiencing such bounty in mid-July. I am so grateful to have a beautiful yard and if my biggest problem is that I can’t pick the food fast enough or that the flowers are a bit too crowded, I can’t complain! The monarchs have arrived at Natureworks. 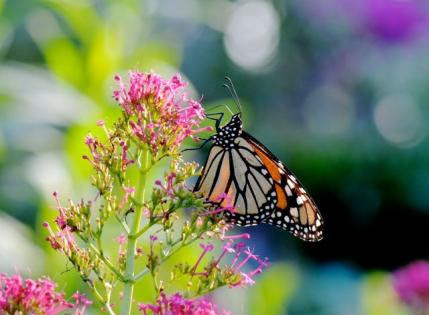 We are thrilled to offer them all the milkweed they need and lots of nectar flowers as well. Above Diane captured a monarch on Centranthus ruber, a long blooming perennial currently on our benches. This Thursday at 4 pm we are thrilled to be hosting Dr. Kimberly Stoner of the CT Agricultural Experiment Station. She will talk to us about the state of the bees in CT. Just this week there was an article featuring her work in the Hartford Courant. Finally, this important topic is getting the attention it deserves. 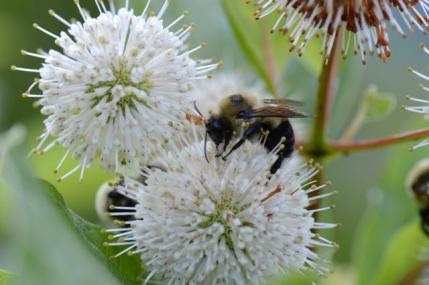 At Natureworks, there are bees and pollinators literally all over. The place is BUZZING! But that is not the case everywhere. Kim is so knowledgeable and is doing the cutting edge research that is desperately needed in our state. Come, listen to her, learn from her, and spread the knowledge to all of your friends and neighbors. We can all make a difference. 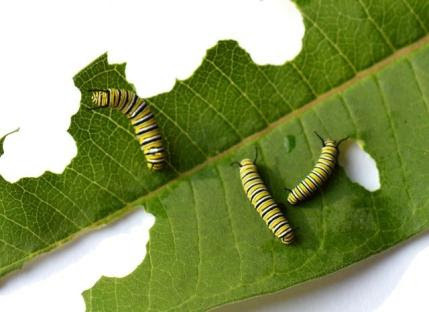 Three of our monarch babies munching away on milkweed leaves. Your garden is a sanctuary, a place to relax, sit, and watch the world buzz with life. It is important to sometimes STOP weeding and deadheading and just BE in the garden. Unplug, leave the cell phone in the house, take a deep breath, and let your garden work its magic on you this week. I guarantee it will cure what ails you, on so many levels. Stop intoNatureworksand let our gardens work our magic on you as well!